Moustache badge in the classic, Keep Calm theme, always a popular design around Movember! 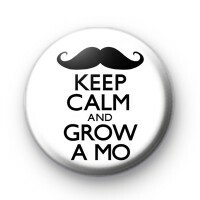 This black and white 25mm tash badge has the text, Keep Calm and Grow a Mo written in black with a hipster style black moustache at the bottom. It lets everyone know you're growing your Moustache for Movember, or that you just love facial hair. Either way, this is a great badge to pin to your jacket. These badges are great to help with Movember fundraising and we send out a lot to Mobros friends & family who are helping to fundraise. Our moustache badges are also really popular with barbers shops. We have a massive range of Moustache badges available on the website, so if you are a tache lover, be sure to check out the rest of our moustache badge category. Standard 25mm button badges handmade in our family workshop.